New Buffalo: Why This Small Resort Community Should be on Your Travel Radar! I begin this post as I’m sitting on the rooftop deck of the Marina Grand Hotel. I’m in a place of total peace and relaxation, and I’m grateful. Coming off of an especially hectic prior week, I was looking forward to my escape to New Buffalo. Although a short 2-day trip, I’m leaving refreshed and happy. My son, my friend Carol, and I arrived in New Buffalo the day before. New Buffalo, Michigan is a Midwest resort community located on the shores of Lake Michigan at the mouth of the Galien River. The town has a population of around 2,000. Although a popular destination for many, especially Chicagoans (the town is an hour and a half drive from Chicago), a great number of those I’ve spoken to state that they’ve never heard of the town or have only passed the city while on the highway, never stopping in. They’re missing out on this gem! Since we only planned a 2-day trip, I wanted to get into town pretty early. We arrived around 9 a.m. and breakfast was the priority. We stopped in for a bite at Jackie’s Café owned by Chef Jackie Shen. It’s a quaint café on one of the main roads of New Buffalo. The place is intimate, so it was easy to catch a glimpse of Chef Shen in the kitchen. Not long after I caught a glimpse, Jackie comes hustling out of the kitchen to greet tables of customers. She’s obviously very personable. We ordered the Belgium waffle, Quiche, Eggs Benedict Benito, and Buffalo Bill. My eggs Benedict was on top of a jalapeno cornbread that had an evenly distributed heat that made for a tasty dish. I’d get that again. At one point after our meal, she came to our table to chat us up and see how we enjoyed our breakfast; very friendly and full of energy. It was a pleasure meeting her. Lining the walls of the hallway leading to the restrooms are awards and newspaper clippings highlighting her career and achievements. I learned that Chef Jackie Shen is one of Chicago’s original celebrity chefs and was regarded as the Queen of Fusion. Following breakfast, we headed to the Marina Grand Resort hotel for check-in. Wow! This place is gorgeous!!! I see myself having a glass of wine this evening on this couch. We had an early check-in which was pretty cool as I wanted to get started with our day of activities. The two-room suite that was reserved for us was awesome! It had a nice-sized living and dining room, fully stocked kitchen, and a patio off each of the bedrooms. You can easily sleep up to 8 people between the two rooms. Once I saw the room, I just wanted to hang out there! There would be time for that later I guess; best get moving. The resort’s location is ideal for exploring. It’s within a short walk to the beach, restaurants, and shops. Complimentary bicycles are provided for guests; after our selection, we were on our way. We cruised up to take a look at some of the homes and fantastic views around the town, and then to the beach. I love the convenient proximity of the beach to the town’s shops and restaurants. It’s an easy walk if you care to grab lunch or ice cream cones. Or there’s the option of having one of Redamak’s famous burgers at their beachside grill. If you appreciate learning the history of towns you visit, you may want to stop and take a look at the walking tour map located on the beach. It gives the history of the town and directs you to points of interest. The beach is the starting point of the tour. After returning our bikes to the resort, we headed out for a light lunch at SONG sushi. I’d heard many good things and recommendations for SONG, but it was my first time here. The sushi was yummy; I’ll return. The weather was beautiful! We took advantage and headed to Galien River County Park for a walk. The park consists of 86 acres of mostly wetland with tons of wildlife. It’s a wonderful place to find a bit of tranquility. There are elevated walkways for the visitor to check out the marsh. We came to a father and his daughter spending the day fishing. Others were passing through in kayaks, hmm maybe next time I’ll do that. After our walk, we departed the park, dropped my son off at the hotel, and then Carol and I set out for a bit of wine & olive oil tasting before dinner. We stopped in at Promeny Olive & Wine, a shop that offers unique wines from all over the world and gourmet olive oil. Carol had never experienced an olive oil tasting, so that was fun watching her sample. Also located in the shop was Black Dragon Meadery. I was intrigued as I’d never tried Mead wine before. We got on with our tasting, and I liked the Mead wine! My favorite was the Dragon’s Blood made with Michigan cherries. We had a ball trying all of the wines and chatting up the shop employees. At one point we were the only tasters in the place, so that was a treat. I got to ask lots of questions. It was nice hearing the stories of others and making connections. We made several purchases, including Yakut, a dry red from Turkey, another one of my favorites from the day. Once back at the hotel, we chilled on the patio with our wine. It was so quiet on the harbor. Our room was perfect! It was now time to head to dinner at Bentwood Tavern located in the resort. Bentwood offers artisan comfort American cuisine from Chef Jenny Drilon. I was excited when I saw the wood fired pizza oven. We started off with a few appetizers and let me just say they were amazing! The soft rosemary sea salt pretzels stood out to me because I’m not crazy about soft pretzels (too heavy). However, I couldn’t get enough of these. They weren’t too heavy or overly salty, and the mustard and aged white cheddar jalapeno dip that came with it was delicious! I highly recommend the soft pretzel! We also enjoyed the fig and prosciutto pizza (Have Mercy!!!!) I’ve replayed me eating this many times over! The sweet and savory combinations were on point and that crunchy thin crust, ahh! I also had the Bankok Chicken. The skin was seasoned well and crispy while the inside was moist. The sauce was light and sweet with the heat on the end. The pickled cucumbers were ooooh good too! Let’s just say that I ate myself into a food coma. Crab cakes, goat cheese dip, pizza, pretzels, etc…… No regrets! After dinner, we headed to the resort’s roof top to hang out and watch the sun set. This place has it all! High top tables, comfortable furniture. We took our own wine to the rooftop but on Fridays and Saturdays, from 5-10 p.m. there is bar service available there. I’d say our first day was a WIN! As stated at the beginning of this post, I started the next morning off early on the fabulous rooftop of the Harbor Grand. I’m a bit obsessed with this rooftop! On my way up I stopped at the café and picked up some fresh pastries that were prepared the night before. The resort has an on-site pastry chef that makes all kinds of goodies nightly. Boy, can you tell the difference when everything is fresh… Delightful! We headed out around 11 am. I’d planned on breakfast at Nannis Café but discovered that they were only open Friday, Saturday, and Sunday…boooo….will have to make a return trip for that. I’ve heard great things. We decided to head to Luisa’s for breakfast instead. I don’t know how but I walked into Rosie’s thinking it was Luisa’s….I was so confused. I didn’t realize it until we were seated and given menus. No worries, it was a Happy Accident, as service was friendly, and our food was good. It was about 90 degrees out, and I ordered chili, lol. It tasted homemade. My Greek salad was very fresh and tasty too. We all agreed that Rosie’s was a great place. Lining Whittaker St. are many shops offering unique finds. We first popped into the T-Shirt Factory. If you’re looking for customized t-shirts, this is your spot. Pick out your shirt and d-cal, and Amir, the owner, will have it applied in minutes. We next popped into Hidden Gem. Owned by cousins Jessica and Lisa, the eclectic shop showcases many items from local artists. Next up was Sweetwater, my husband’s favorite shop. He could spend hours in this place! We took a break from shopping to do another round of wine tasting, this time at Warner’s tasting room. We received five tastes for $7; it was money well spent! I look like I’m watching to ensure that I get a fair taste, haha…I’m not! Warner Vineyard is the 2nd oldest winery in Michigan, and it’s one of only three wineries that uses all Michigan grapes. Patty greeted us as we entered…I took to her right away because she had Stevie Ray Vaughn blasting overhead. She’s quite the people person and knows her wine. Great customer service in this place in addition to many excellent wines. It’s hard for me to pick one favorite as there were several wines that I favored. I loved the 2Cab/Merlot, Riesling, and Gewurztraminer. I always have trouble pronouncing Gewurztraminer; Patty teaches her customers to say girls are meaner in order to remember the correct pronunciation, lol, it works! After leaving our wine tasting, we walked a bit more around town before heading home. This getaway went way too fast! Funny moments and memories to cherish! You can’t head out of town before stopping at OINK’S for ice cream. In business for 30 years, OINK’S is a favorite spot. Make sure you take the time the check out the nostalgia explosion inside. So many neat things to bring back recollections of year’s past. There’s also a candy store attached. OINK’s serves Sherman’s Dairy ice cream. Sherman’s is dear to me because it’s located in the resort town of South Haven, Michigan where I grew up. I spent a lot of time at that place! In business since 1916, Sherman’s Dairy still makes ice cream the old-fashioned way. I have friends who drive from Chicago to South Haven just for Sherman’s ice cream. It’s that good! Our visit to OINKS was the perfect way to top off our 2-day getaway. New Buffalo is a charming, beautiful, laid-back town. This girl was able to slow down, decompress, and enjoy many good moments. Can’t wait to return! I hope that you create the opportunity to experience this lovely town for yourself. Make sure you share your memories in the comments. *Although the Marina Grand Resort hosted me, all thoughts and expressions are genuine and my own. The pictures and description of New Buffalo really remind me of Saint Joseph. Such a peaceful looking place! It’s very peaceful there. I also adore St. Joseph, I can see the similarity. My family is from New Buffalo and I live in the next city, so excited to read your post. I actually worked at Oink’s as a teenager! I love the pictures and places you shared! New Buffalo is a great little town yo relax, along with a day on any beach on Lake Michigan! So true, there are so many great beaches in the area. How cool that you worked at OINK’s. I love all of the cool treasures in there! It looks like a great place. Can’t wait to visit! I’ve never heard of it, but what a quaint little town! Looks like there’s a lot to do there too! This looks like a fantastic trip! And a Gorgeous hotel! Looks like you had a great time and that rooftop is just the perfect place to sit back and watch the world go by. Ice cream is tempting. Lovely I must say! close to the shore with ample activities, biking and some delicious food. It seems a perfect win ! What a fun spot to visit. I think little towns are sometimes so overlooked. I love that the place you stayed at gave out bikes! To me that’s a bonus! The food look delicious and I would have to stop at Oink’s for sure. Looks awesome! Although I live in Chicago, I’ve never knew this place existed until now. 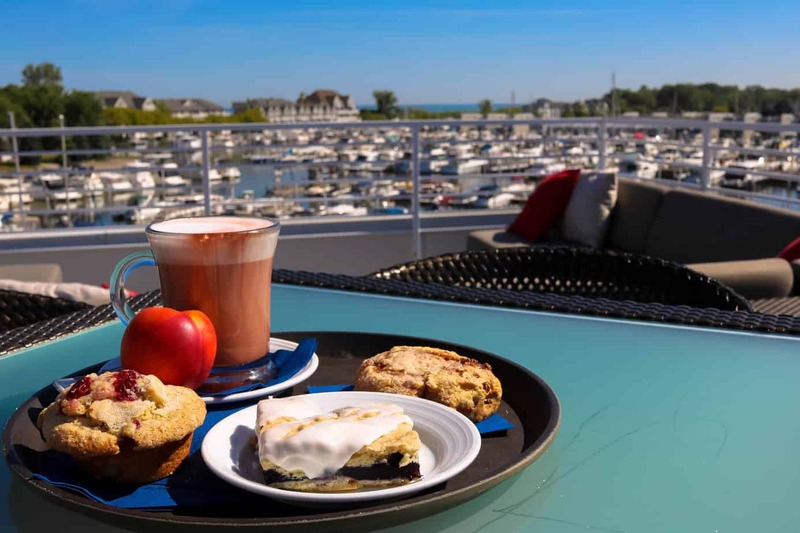 Of course there are lots of lakeside communities around Lake Michigan including St. Johns and South Haven. I’ll have to add New Buffalo, MI to my list. June the dog’s face is priceless. LOL! The views are spectacular but the food is an even bigger pull for me. Looks like you had fantastic weather for all of your adventures too. Great post! I’ve never heard of it but this looks like a fantastic trip, Thanks for sharing! The place and the food look great. It’s important we set time to enjoy ourselves. Thank you for sharing. Wow, looks like you had a great time girl. I must say food and activities are absolutely important when visiting anywhere. It seems like this resort met those demands very well. It’s so beautiful. Adding it to my bucketlist when I visit. That’s so cool that Michigan has a little resort town that looks pretty amazing. It’s been a while since I’ve been there and I know it’s been hard hit by so many awful things. I will have to check this place out when I get the chance to head back there. I love to learn about small towns that I’ve never heard of before. Especially those located outside of a big city. I will have to bookmark this for our next trip to Chicago. Thanks so much for sharing!